Milk Clouds | Raw & Unearthed. Clouds are those fluffy, magical things that float carelessly in the sky, they follow you in your car and change form into unicorns, dragons and the faces of people who have gone but aren’t forgotten. A child once told me they were made out of milk. A pure explanation from a pure mind. 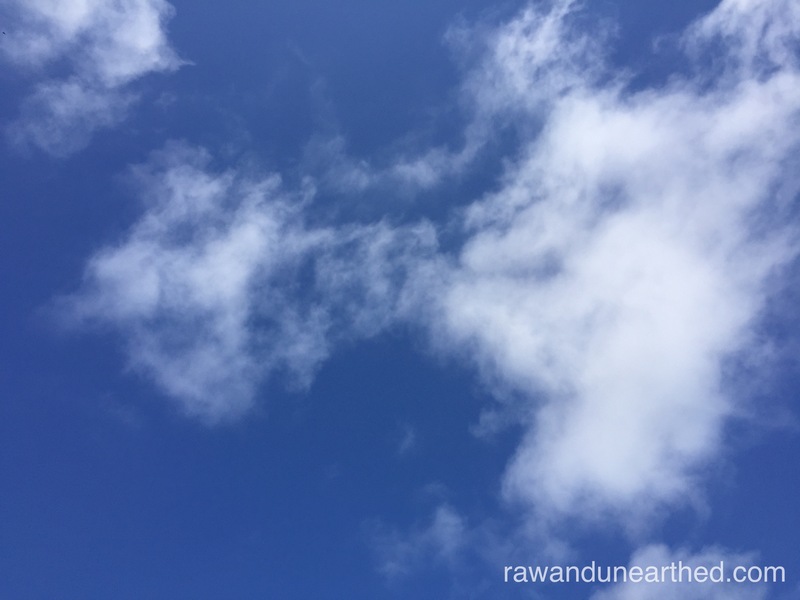 I could see the resemblance as I gazed wondrously up into the blue and sunny sky, but I thought to myself not all clouds resemble milkiness, not all clouds are created equally or serve the same purpose. Storm clouds, are dark, aggressive and black. What are they made of through a child’s pure eyes? I wonder if it was a different day back then, would I have still been laying down on the grass with a group of children gazing up into dark gloomy endless skies. In all honesty probably not. Would I lay in a field gazing up at dark storm clouds today? I most definitely would! You see, I’ve changed. I have allowed myself to evolve and grow. As my hunger for new knowledge and research has grown, my practice has become filled with reason and I have become filled with joy, energy and motivation. As an educator continuity of learning for yourself is a valuable quality to your professional self. These days the moment you finish your degree it changes and a day from graduation your qualifications are already outdated. While it wont stop you from obtaining a job within the industry, it may limit your on-going practice. If you don’t continue self study and research beyond the walls of your university lectures, you will fast become stuck in a rut, repeating the same same each year. We are a profession, not a bunch of whiny babysitters who want more pay. Stand up, (wo)man up and teach yourself to become a strong voice for the early childhood industry. As an industry we are evolving too. There is a change coming, the clouds are moving and changing shape. It’s the calm before the storm and after the storm, the milk clouds will return and rain over us as we prance through the open fields with flowers in our hair. I am a dreamer, what can I say. In all seriousness, there really is a change coming. I can feel it. I know it, and while there may not be milk rain and unicorns, there will be play and lots of it deeply embedded into kindergarten classrooms. I recently was invited to a Department of Education networking meeting in my local community. Within a room full of Assistant principals, Kindergarten teachers and Primary school coordinators, I was the only Early childhood teacher. I have built a strong relationship with my local Kindergarten Assistant Principal and she had invited me along. I was unsure what to expect but oozing with excitement at the opportunity that lay before me. During the meeting I was able to share aspects of practice within the Early Childhood Industry. Questions were asked about holistic approaches, learning through play and intentional teaching. The air was thick with their desire to know more, to build on their own knowledge and unpack new ideas. Prior to the meeting I had a Kindergarten teacher spend a day with me to gain hands on experience of a true play environment- of course she left skipping and dancing out the door, filled with excitement and new ideas. She had allowed her mind to be opened and new ideas flowed freely in. I know we all face barriers, fears and challenges. I also know transitions take time. I’m not expecting this teacher to throw all her structured lesson plans out the window (not just yet anyway! ), but I hope to see fresh ideas within her class room when I visit in the next few weeks. Allowing your mind to be open to new ideas, thoughts and practice you have already taken the first step. It is the second step, advocating for the change which is the tricky one. It can be unstable. But, like everything else, persistence is the key. It has been my dream to really connect with schools to advocate for change and actively work together. Breaking down the barriers and really seeing the change before my eyes. Play in kindergarten classrooms is not impossible. Teachers have already begun reaching out and connecting with Early Childhood Educators. Viewing us as professionals has been the first step for them, a big one at that! Sharing knowledge, working together and continuous visits to each others learning environment will lead to amazing things! Kindergartners may even be allowed to use authentic play tools! – you should have seen their faces when I told them I have allowed children to cut with real saws, build their own campfire and even cook on it. Jaws literally dropped to the floor. “You let them play with fire and have tools we don’t even let them run”, they exclaimed picking their chins up off the floor. The shock factor of this conversation led to a really interesting reflective conversation about risk taking and utilising outdoor spaces. We discussed how Early Childhood Educators view children as capable, resourceful and we trust them to understand their intrinsic motivation in regards to risks. Alternatively, schools have so many rules and structures that children lose their independence and ability to continue to build on the skills we work so hard to promote. Within our meeting they shared their desire to utilise the grass areas and trees they can see from their classroom windows. When I asked why they don’t…….why can’t you read a book or do some writing under a tree?…they first looked at me dumbfounded and then realisation spread across their faces. It really is that simple. The desire for change appeared to be there, but it seems fear has taken over. It’s up to us to give them a little push. The gap between early childhood and kindergartens is just too big. That cloud has become big dark and heavy. It’s bursting with a downward push of academic expectations from a competitive society. It’s Kindergarten, not university! Why is everyone is a rush for their child to walk, read, spell and count? Outcomes haven’t changed, but the expectations have gone higher. It seems now school teachers are feeling the pressure on the eastern front. That cloud is getting far too heavy, we need to lift it up. Children need space to breathe, play and be. We, early childhood educators and parents need to stand strong and continue to make our voices heard. Connect with your local schools, build reciprocal relationships and advocate for the children’s rights. Leap out of your comfort zone, because that is where the magic happens. When the heavy cloud is lifted and I promise you it will, come and dance with me underneath the milk clouds and experience the feeling of purity and free. This entry was posted in Uncategorized and tagged adventures, earlychildhood, kindergarten, natureplay, play, school, schooltransition on February 3, 2016 by raw & unearthed. Amazing piece! Reflections, views and actions like these are just what the Early childhood profession needs. Educators to inspire, educate and promote the importance of play beyond preschools and LDC. This piece not only gets us thinking about the importance of extending play into Kindy, but it provokes reflection on our own practices within our roles… At the end of the day are we dancing under milky clouds with smiles on our faces that we are providing the children in our care with opportunity to play and be…?? Thanks Olivia. The change will come and we won’t stop advocating and inspiring until we are all dancing underneath the milky clouds!